An interactive artwork integrated into the plaza of the Clyde North community centre. The stone vibrates the ground when it is touched. Every dawn and dusk the artwork creates a performance for the community based on the interactions that have occurred during the day. A sound recording of the artwork's pre-installation prototype can be found here. Sound Fountain creates an imaginary connection with the two ancient creeks buried beneath the site of University Square Melbourne, by bringing to the surface those songs and stories that flow through the land. Just as a fountain draws from subterranean waterways to bring nourishment to the surface, so does the Sound Fountain draw stories from the land to immerse visitors in evocative and interactive soundscapes that speak of the ongoing and interweaving histories of University Square. The work applies transformative interaction design technology as a means to evoke a sense of the enduring connection between land and culture for the past 60,000+ years. Our team included a member of the Kulin nations, whose indigenous surface imagery is both hand-drawn and digitally fabricated. This work was one of the three short-listed from a total of 73 applications. A project successfully demonstrating that traffic noise can be made musical. Environmental noise is captured with microphones. The signal is then passed through an algorithm and speaker array, which mixes background noise with processed sound. The final result is called 'noise transformation'. It both transforms the acoustic environment and the perceptions of those immersed in the environment. Field recordings can be found here. The project featured on the front page of The Australian Business Review. 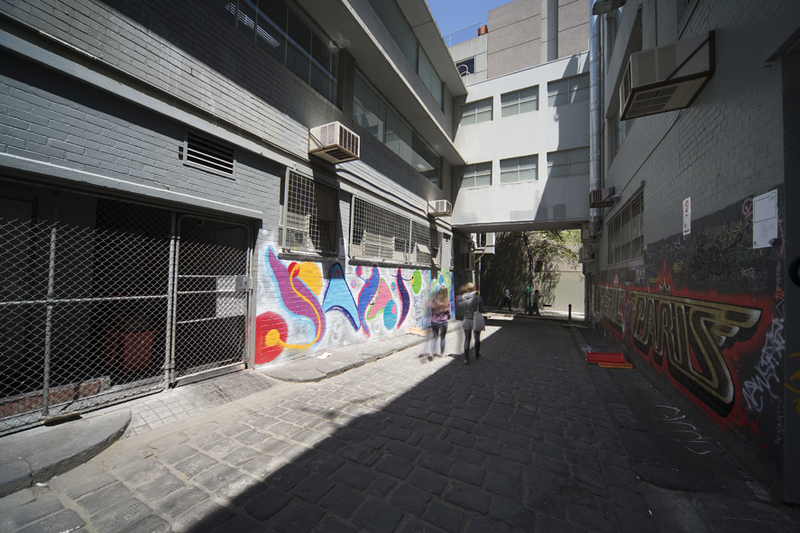 Four readymade air-conditioners with concealed speakers play processed air-conditioning sounds in a hidden Melbourne laneway. The processed sounds were both recorded and played back in the same laneway, creating a surreal sonic environment at once familiar and alien. Graffiti artists and office dwellers had a great time performing with the compositions, through listening and painting. Listen to an interview about the work here. This three part radio series was broadcast on ABC Radio National’s Soundproof program in 2016. The series details an international field trip I took during which I analysed a number of European and North American public sound installations. In collaboration with composer Lawrence Harvey, three creative explorations of the trip were created under the categories: elemental shapings, urban voices and sound forests. A paper was also written about the trip which can be found here. ‘Fielding’ is a research project and public art installation spanning landscape architecture, science, art and sound design and featuring an installation of native plants and a curated soundscape. Three speakers are imbedded in the structure playing a three-track 90-minute loop comprising the works of 10 sound artists. During a curatorial process artists were asked to respond to the concept of ‘broken ecologies’. The structure was designed as part of a student-led landscape studio. An interactive artwork. When sitting on the chair two sets of footsteps walk towards each other and begin to embrace and kiss. Upon tapping and squeezing the arms of the chair the lovers embrace with ever greater passion until the listener is caught in an awkward, though exhilarating, moment. Listen to a live recording here. Sounding Batman Park saw Cath Clover and Jordan Lacey connecting with Batman Park in the Melbourne CBD as participants in a sonic environment, listening for its everyday movements and rhythms. The aim was to discover a shared avian-infrastructural language, which was performed into the site on the final day. Two containers on the banks of the Maribryong River were transformed into glowing, humming objects resonating with the low sounds of trains, birds and the river. The artwork combined light, sound and vibration. As the sun went down, the colours became more vivid and the sounds spread like a dream. Neon by Fiona Hillary. An eight-speaker live spatial sound concert for the 2013 Liquid Architecture Sound Art festival. I spent a month in this subterranean environment recording the adjacent train station, which I shaped with sound design applications and spatialisation software. A curated series of 12 concerts over two days provided audiences with an immersive sonic experience that reimagined the sounds of everyday life. The work was featured on ABC Radio National's Into the Music. Kasia Lynch invited me participate in this unusual project, in which two mediums were invited to read the spaces of the Abbotsford convent. I followed Kasia and the mediums' recording their conversations, from which I produced a series of sonic responses. Sound compositions were accessed by QR codes, placed alongside Kasia's sculptural response to the mediums' stories. The sound files can be found here, and a discussion of the work can be found here. My book, Sonic Rupture, outlines my philosophy and practical approach to installing sound works in public spaces. It argues that sound installations play a role in diversifying the otherwise homogenous spaces of global cities, and that diversification is essential for human wellbeing. The book also encourages acoustic ecologists to engage with urban noise as a creative design material. For more information click here.